Dr. Hisashi Hashimoto, an Assistant Professor, and Dr. Yusuke Nagao at the Bioscience and Biotechnology Center, Nagoya University, along with their co-researchers have discovered the mechanism underlying pigment cell differentiation from stem cells to xanthophores and leucophores. Their papers have been published in PNAS and PLoS Genetics. Body coloration and patterns are determined by pigment cells in living organisms. Previous studies have elucidated the mechanism of generating melanin-producing melanocyte which is common in all vertebrate animals including mammals. However, the methods of formation of other pigments, such as iridophores, xanthophores, and leucophores, have not been explained. Nagoya University has preserved various mutants of medaka that have been collected in the field and has conducted bioscience research with these mutants for more than 60 years. Collaborating with the research group led by Dr. Kiyoshi Naruse, an Associate Professor at the National Institute for Basic Biology, Prof. Hashimoto's research group examined a mutant medaka with no xanthopheres or leucophores. 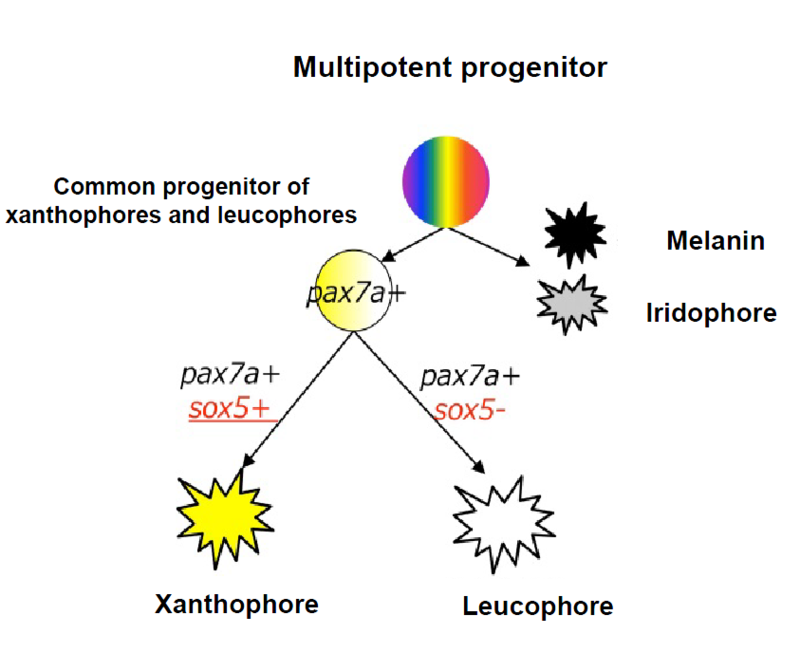 They discovered that the mutant lacked the gene pax7a and explained that pax7a is necessary in early development to generate xanthopheres and leucophores. Furthermore, they examined a mutant that lacked xanthophores but had many leucophores, and discovered that the sox5 gene was defective in the mutant. Thus, it was elucidated that when sox5 is active the xanthophore-leucophore common progenitor develops into xanthophores and when it is inactive it develops into leucophores. These results are widely expected to accelerate the research on various cells' differentiation, not just on pigment cell differentiation. Assistant Professor Hisashi Hashimoto chose the school of agriculture to conduct applied research that could directly contribute to people's lives. He studied edible fish at a fisheries laboratory, with particular interest in the shape of flatfish. He was challenged to explain the formation of the fish's asymmetric body, and to this end he started studying embryology and morphology. Since arriving at Nagoya University, he has studied the inedible medaka species as the experimental material. Currently he is researching cell differentiation and the evolutionary diversity of pigment cells at the Bioscience and Biotechnology Center, using original mutants of medaka collected and preserved at Nagoya University. Colors and patterns created by pigment cells are believed to have an important role in various forms of communication between individuals, including mate selection. In particular, fish have a wide variety of pigment cells which are likely to be used for tactful communication. I expect my research will elucidate the biological significance of "color" more broadly, by describing the development from progenitor stem cells to the many different pigment cells, thus giving insights into the role of color in animal behavior and the evolution of body coloration. For those who can spare no effort and patience for the process of research, I believe there are still many opportunities to experience the joys of science; when you look at things through a different perspective and find a new fact, you can enjoy a sense of mastery that you alone know the fact; you can then publish the fact and surprise people. (Unfortunately, I have not yet fully experienced both of these ultimate joys but I have not given up.) I hope your effort and patience can work for the general good, along with your joy in science.